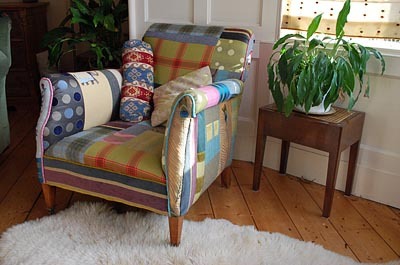 Funky Bobbin is a small upholstery service based in Fife, Scotland. It is run by Jacqueline Donachie and Allan Shiels. Jacqueline has just gained her Diploma in upholstery from The Association of Master Upholsterers and Soft Furnishings. Take a look at the portfolio page to see our work to date. Newport-On-Tay is hosting a late night shopping event which we will be taking part in. Join us at 12 Tay Street to view our work and enjoy a glass of Mulled Wine and a Miniature Marzipan Christmas pudding! Open All Day until 9pm.